Boybands McFly and Busted have confirmed they are going to join forces for a UK tour as a new ‘supergoup’ next year. In September James Bourne and Matt Willis joined McFly on stage at London’s Royal Albert Hall during one of their 10th anniversary concerts. Now Bourne, Willis and McFly’s Tom Fletcher, Danny Jones, Dougie Poynter and Harry Judd will be seen performing as McBusted by thousands more fans at 11 shows across the country. 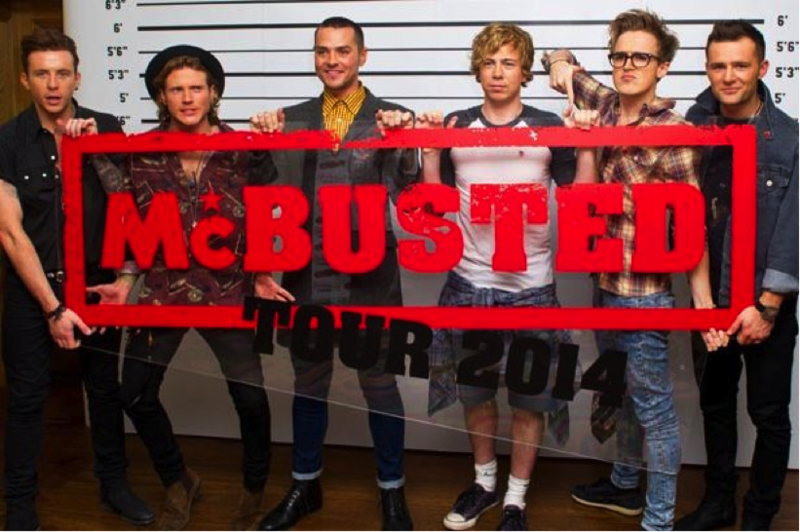 Willis said: “It’s been nearly 10 years since Busted split. That’s a good amount of time for memories to gel in your mind – it’s fun to reminisce now, the right moment to revisit those songs. And to do it with McFly makes it more of an event. The coming together of two forces!”. McFly have assured fans that the project is a fun break between their official albums and confirmed that they will perform solo again. Tom Fletcher said he was excited to finally join Busted after being rejected from an audition ten years ago. Charlie Simpson, who left busted in 2005 to pursue a career with band Fightstar, has wished his ex-bandmates luck with their plans: “Just wanted to say that though I am not joining Matt Willis and James Bourne on their new venture I wish them all the very best with it!” he wrote on Twitter.